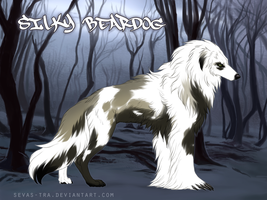 Silky Beardog Art PointsAll art of your Silky Beardogs are worth Art Points. Gathering Art Points is an optional part of the game and will serve a purpose in the future. To keep track of your art points, please make a journal with links to the art of your Beardog. You may include art of your Beardog if the picture was drawn for another group (your Beardog was a handler, etc), but that art will be worth half of the points total. Silky Beardog genes are made of pairs of alleles. The alleles are represented by abbreviations of the name of the gene. Example - the Light Accent gene is abbreviated as La. If a Beardog has both alleles, it is written as LaLa. If it only has one allele, it is written as nLa. When bred, each pup will receive one allele of each gene that the parents carry. The Genotype field in the description on a Silky Beardog reference is a list of abbreviated genes that a Beardog has, and how many alleles of each gene. The Phenotype field in the description on a reference is a list of genes that appear visually on the Beardog. 1. Dominant - these genes have only one form and a Silky Beardog needs only one (nLa vs LaLa) for it to appear. Silky Beardog Pup Raffles - All Winners Announced!Update - Winner has been chosen by RNG for Raffle 1! These raffles are reserved for those who are interested in playing ARPG with their pup(s). Raffle 1 - Won by BeachBumDunkin !! How do I get my first bby? Is there anyone willing to design my pup for me? I'm not sure where to ask this, but will there ever be free staters for those of us who want to get into the breed but have no means of buying through da points or real money? There have been raffles and there will be more.